Fortune Frenzy Mobile Casino Review -- Fantastic and Mobile! Fortune Frenzy casino offers mobile slots and some casino game on both mobile and desktop! 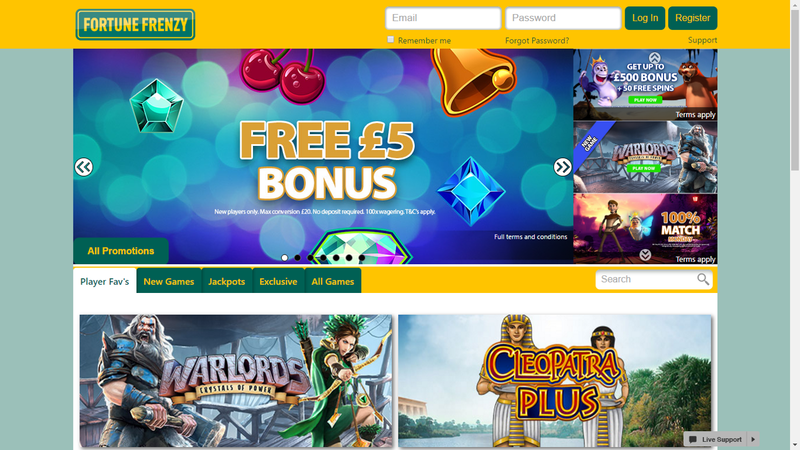 Claim £5 Free Welcome Bonus! Check out Fortune Frenzy now! Fortune Frenzy is a unique mobile casino with lots of mobile slots and regular updates to their gaming library including games from NetEnt and NextGen. 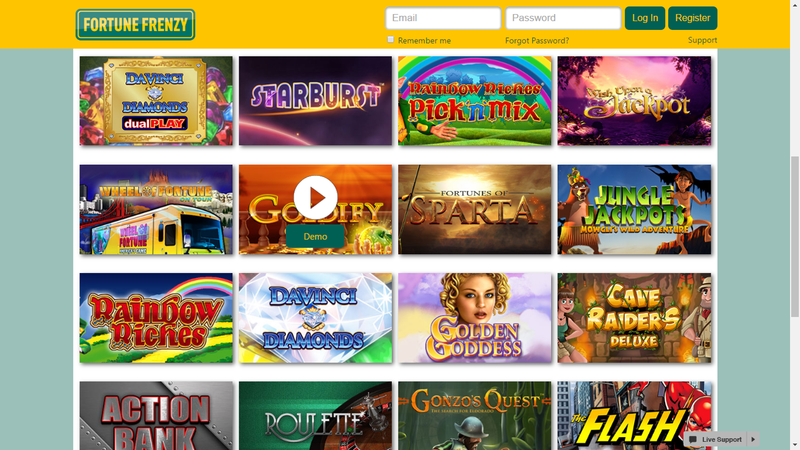 Having been released in April 2013, it began as a humble straight-to-mobile casino — that is, it has no real online presence until quite recently when it took on the Nektan formula and designed a website for desktop users based on their paradigm. But how does it fair on the promotion department and on other things? Was this transition as smooth as it could have been? Read on to find out. Fortune Frenzy gives us what the modern mobile gambler always looks for — mobility and substantial content. On the mobility front, Fortune Frenzy can be operated on almost every mobile device available, which makes sense as it has its roots in being a solely mobile slot provider. As for the content side of things, this is achieved very well with the desktop version of the website which can be accessed from the main page by clicking the ‘play now' button. There are far more games to be had plus a ton of promotion schemes for players to make use of, making Fortune Frenzy both plentiful and convenient. The gaming library of Fortune Frenzy is where the website really shines. It predominantly features slots from top companies such as NetEnt and Nektan. It includes many of the classics such as Starburst and Gonzo's Quest but also includes new games such as Warlords: Crystals of Power. The mobile version has far less in terms of content, however it does let you download their games straight to your mobile so that you can play them anywhere you wish! Again, these are mostly slots too but it goes to show that Fortune Frenzy hasn't forgotten its roots. On the other hands, we do feel they have paid more attention to their desktop site than they did to their mobile site which is unfortunate. However, if you can access the desktop Fortune Frenzy from mobile, you're in for a real treat either way. The best thing about Fortune Frenzy has to be its plentiful bonus and promotion schemes which we would argue are extremely satisfying to players and enough to keep you lasting a while. The first thing new players get is an immediate £5 welcome bonus which will get you started on tackling their vast amount of slots. But the fun doesn't stop there! You can also get up to £500 and 50 extra spins when you make your first three deposits. As well as these, you get your weekly promotion schemes such 100% Match Monday and 25% Win Boost Thursdays. These promotions are peppered throughout the week to shake things up a little bit, giving Fortune Frenzy a much needed edge over other mobile casinos. Last but not least, Fortune Frenzy always has a new game promotion scheme so whenever a new game is introduced to the site, you're likely to see something promoting the game and considering how regularly the site is updated, you're likely to see that a lot. At the moment, they are holding a promotion scheme for Warlords: Crystals of Power with 150,000 extra spins to be given away. It's a fantastic opportunity and allows you to enjoy new content on a regular basis. It may even help you find your new favourite slot! Fortune Frenzy also has a VIP scheme (also known as the Privileged scheme) which is an invite-only exclusive upgrade to the bonuses and promotions for loyal players. It includes cashback offers, better customer support, deposit rewards, extra spins and regular cashback bonuses. If you're invited to the Privileged scheme, we definitely recommend that you join as it can enhance your experience with Fortune Frenzy and make you enjoy the casino even more than what it offers to most other players. Payment for Fortune Frenzy is quite simple. There are many methods that players can have access to which makes putting down your first deposit an absolute breeze. You can do so by using your credit or debit card (VISA, Maestro, Mastercard) or you can use their various ewallets such as Neteller and Skrill. However, there is an alternative if you don't fancy entering your card details and that is Boku. With Boku, all you need to do is send a text from your mobile and you can be playing slots within minutes! Withdrawals take up to three days to complete and players can deposit and withdraw a minimum of £10. It's not the fastest of withdrawal times (it's about average) but it's certainly not the worst. For customer service, Fortune Frenzy is quite strong. It provides players with an FAQ page which answers the most common questions asked by any (mostly new) players. For inquiries that are more specific, you can use the Live Support option available on the website or contact them via email at [email protected] as well as by phone at +44 203 621 7010. They should sort you out in less than no time! Want to play at Fortune Frenzy? Fortune Frenzy is a very modern mobile casino with great games and bonuses! Claim £5 Free Bonus Now! Fortune Frenzy Overall, Fortune Frenzy has a lot of content for players to enjoy plus a ton of promotions and a strong customer support to go with it. Its only downside is that it has favoured its desktop website more than the mobile version and we think that they could really develop the mobile version as that is how the market is nowadays. But for what it is, it's still pretty good and players will almost definitely be coming back for more. It's a definite recommendation on our part. NextWhat Are The Differences Between Boku Mobile And Payforit Depositing?